I love to accessorize. In fact, many mornings I choose my outfit based on an accessory I want to wear that day. Starting with a color or aesthetic when getting dressed can lead to much more creative outfits and feeling more inspired to try new combinations of colors and patterns. Many of the jewelry pieces I wear are made by myself, other artisans or are found at vintage shops. I gravitate towards pieces that are colorful or one-of-a-kind. I've always liked when artisans refer to their jewelry as "wearable art". With that thought in mind I wanted to find a way to display my collection ... not only to easily access my jewelry when getting dressed in the morning, but also to admire my trinkets on my dressing table. 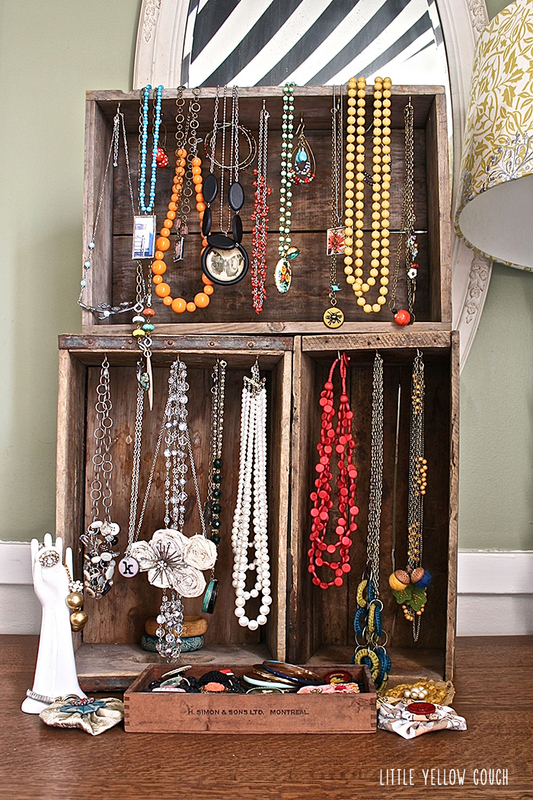 A stack of three vintage crates picked up at a local antiques show made for a clever canvas and cup hooks can be added in multiple rows and even on the tops and sides as your collection expands. 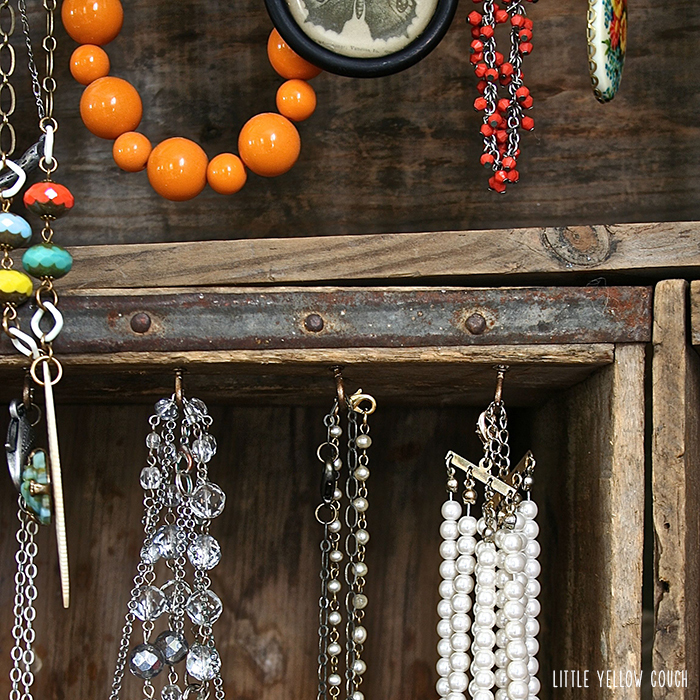 Hang and enjoy your jewelry! *** P.S. Look below for a clever display solution for your rings! *** Looking for a clever way to display your rings? 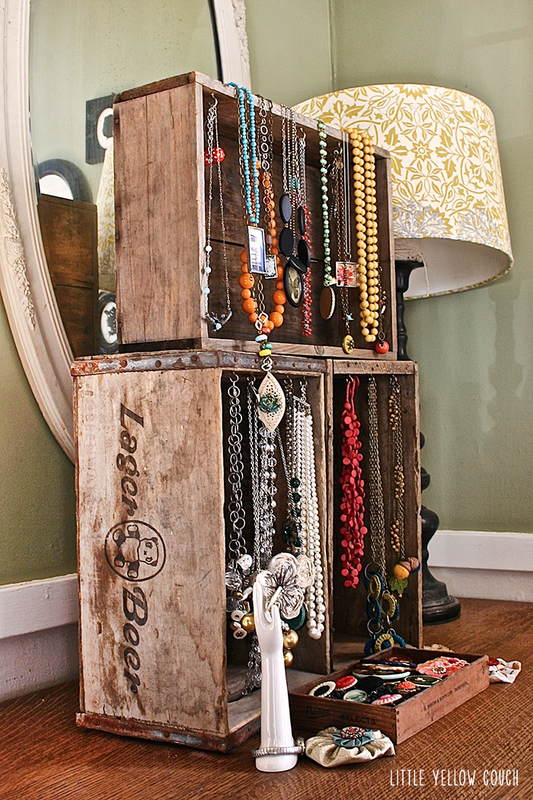 Cigar boxes filled with black beans are a great solution and look great with your vintage crates!